“A long-standing challenge in physics has been finding evidence for dark matter, the stuff presumed to make up a substantial chunk of the mass of the universe. Its existence seems to be responsible for the structure of the universe and the formation and evolution of galaxies. But physicists have yet to observe this mysterious material. Results reported today by a China-led space science mission provide a tantalizing hint—but not firm evidence—for dark matter. Perhaps more significantly, the first observational data produced by China’s first mission dedicated to astrophysics shows that the country is set to become a force in space science, says David Spergel, an astrophysicist at Princeton University. China is now “making significant contributions to astrophysics and space science,” he says. Physicists have inferred the existence of dark matter from its gravitational effect on visible matter. But it has never been observed. China’s Dark Matter Particle Explorer (DAMPE) was designed to try to fill that gap, by looking for an indirect decay signal of a hypothetical dark matter candidate called weakly interacting massive particles (WIMPs). Researchers launched the spacecraft from the Jiuquan Satellite Launch Center in the Gobi Desert, about 1600 kilometers west of Beijing, in December 2015. Its primary instrument—a stack of thin, crisscrossed detector strips—is tuned to observe the incoming direction, energy, and electric charge of the particles that make up cosmic rays, particularly electrons and positrons, the antimatter counterparts of electrons. 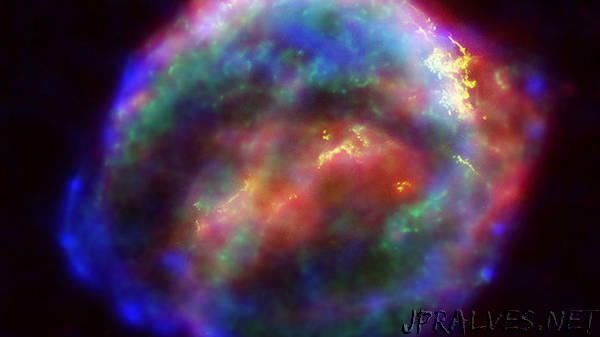 Cosmic rays emanate from conventional astrophysical objects, like exploding supernovae in the galaxy. But if dark matter consists of WIMPs, these would occasionally annihilate each other and create electron-positron pairs, which might be detected as an excess over the expected abundance of particles from conventional objects. In its first 530 days of scientific observations, DAMPE detected 1.5 million cosmic ray electrons and positrons above a certain energy threshold. When researchers plot of the number of particles against their energy, they’d expect to see a smooth curve. But previous experiments have hinted at an anomalous break in the curve. Now, DAMPE has confirmed that deviation. “It may be evidence of dark matter,” but the break in the curve “may be from some other cosmic ray source,” says astrophysicist Chang Jin, who leads the collaboration at the Chinese Academy of Science’s (CAS’s) Purple Mountain Observatory (PMO) in Nanjing. The DAMPE results appear online today in Nature. More data will be needed to confirm what DAMPE is possibly seeing. But there is good news on that front. “We expected a 3-year life for the satellite,” Chang says. But given the smooth functioning of the spacecraft and its instruments, “we now expect it to last 5 years,” he says. That will allow the satellite to record more than 10 billion cosmic ray events. Fan Yizhong, a mission astrophysicist also at PMO, adds that DAMPE’s observations will complement those of other space- and ground-based instruments to ultimately clarify whether there is a connection between the anomalous signals and dark matter annihilation. The DAMPE collaboration comprises four institutes under CAS, including the National Space Science Center in Beijing; also involved are the University of Science and Technology of China in Hefei, the University of Geneva, and Italian universities in Bari, Lecce, and Perugia. The satellite has been named Wukong, after the Monkey King character in the 16th century Chinese novel Journey to the West. DAMPE was also China’s first mission dedicated to astronomy and astrophysics, though it was joined in space in June by the Hard X-ray Modulation Telescope, intended to observe x-ray and gamma ray emissions from black holes, neutron stars, active galactic nuclei, and other phenomena.